A viral picture of the Dalit leader being beaten up is doing the rounds on social media. Mevani was in Begusarai to campaign for former JNUSU president Kanhaiya Kumar. 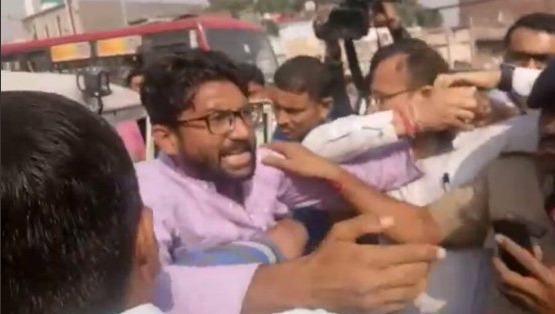 Gujarat MLA Jignesh Mevani, who had spearheaded a Dalit movement in his state a couple of years ago, had visited a protest in Ahmedabad last year after an activist Bhanubhai Vankar immolated himself over allotment of land to Dalits in Dudkha village of Patan. Vankar had set fire to himself on February 15 last year. 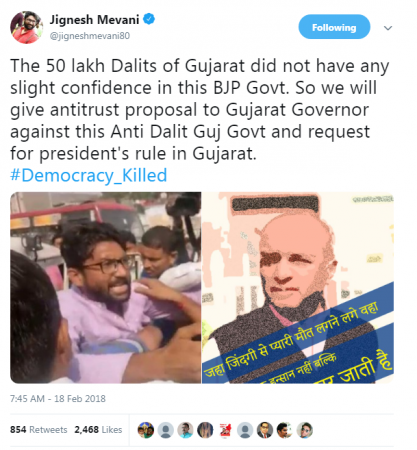 A few days later, Jignesh Mevani had visited the protest site on February 18, in which he was 'manhandled' by the police. A year later a viral picture of the Dalit leader being beaten up is doing the rounds on social media. Mevani was in Begusarai to campaign for former JNUSU president Kanhaiya Kumar who will contest the Lok Sabha elections from Begusarai constituency. According to a Facebook user's claim, Jignesh Mevani was slapped thrice and then bashed up separately in Begusarai . "The audacity of this fellow to land in Bihar after abusing and beating up scores of Biharis in Gujarat some months back...! He was incidentally there to campaign for Kanhaiya. That's the way these traitors need to be treated," read the post. 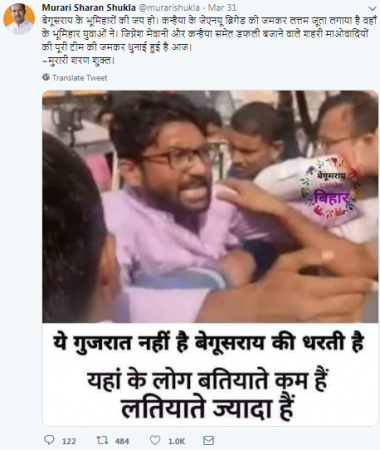 This message is being circulated with a picture that shows Mevani in a scuffle with a mob. A similar message with the same picture read, "The JNU Brigade of Kannhaiya has been grounded by the youngsters. The entire team of city Maoists, including Jignesh Mewani and Kanhaiya, have been fiercely washed away today." The English translation of the caption read: "This is not Gujarat, this is the land of Begusarai. Here, people let their fist do the talking." The above claim comes in the backdrop of the Gujarat MLA's recent visit to the Begusarai constituency to campaign for the candidature of CPI's Kanhaiya Kumar. International Business Times has found this post to be MISLEADING as this viral picture is from Ahmedabad and was shot in February 2018. The news has also been debunked by the AltNews. 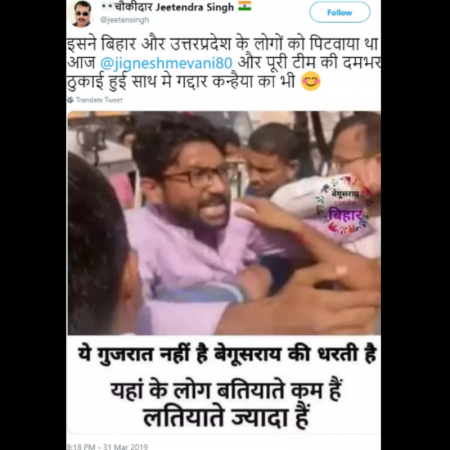 The image of the incident was shared by Mevani himself on Twitter in 2018.